NEW HAVEN, Conn., July 31, 2018	(Newswire.com) - Cyber security experts from Yale University have released a report detailing the critical and challenging areas of cyber risk in the modern era. The report synthesizes discussions held at the second annual Yale Cyber Leadership Forum in April. 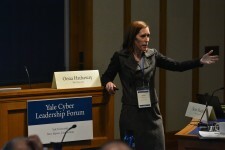 Oona Hathaway, Director of the Yale Cyber Leadership Forum and a Professor at Yale Law School, edited the report, together with Ido Kilovaty and Edward Wittenstein. The report is free and available to the public on the website of the Yale Cyber Leadership Forum. The Forum focuses on bridging the divide among the law, technology, and business communities in cybersecurity, and exploring effective approaches to recognizing, preparing for, preventing, and responding to cyber threats. To address cyber threats, we need to bring together specialists from different sectors to work together and learn from each other. The Forum aims to create conversations across disciplinary, professional, and technical boundaries. The more people we can bring into the conversation, the better. I hope the report will help advance critical thinking and help us all move toward a better understanding of cyber risk and how to combat it. 1. Cyber risk, including how to identify and quantify cyber risk, how to manage new risk as a result of the emerging internet of things, and how best to ensure basic cyber hygiene to manage cyber risk. 2. Legal and technical tools available to address cyber risk, including encryption, international law and cooperation, and domestic criminal law enforcement. 3. Business-specific challenges, including how to develop effective Board-level cybersecurity knowledge, make responsible cyber investments, develop effective reporting relationships, and nurture executive cyber expertise. 4. Emerging threats, such as those presented by digitization, big data, and the rise of artificial intelligence; as well as some possible solutions, including better education as to risks and how to avoid them, and improving information sharing to better enable criminal law enforcement across borders. The third iteration of the Yale Cyber Leadership Forum will be held March 3-5, 2019. A collaboration among Yale Law School’s Center for Global Legal Challenges and Yale’s Office of International Affairs, the Forum brings a wide variety of experts together to discuss the most critical cybersecurity challenges. Global management consulting firm McKinsey & Company serves as a knowledge partner to the Forum, integrating McKinsey’s extensive knowledge of best practices in cybersecurity with Yale’s scholarly expertise and distinguished practitioner alumni. For more information on the Forum and how to apply, visit http://cyber.forum.yale.edu. Event organized by the Women for Africa Foundation in collaboration with Yale University with backing from Banco Santander via Santander Universidades.